In stock -This product will ship today if ordered within the next 8 hours and 40 minutes. TERRANOVA Magnesium Calcium 2:1 Complex is enhanced with highly active, whole and unadulterated superfoods and botanicals. Maintains healthy bone density, relaxation of muscles and many other functions. As well as supplying an abundance of magnesium, rice bran`s nutritional value is phenomenally superior to other brans. Barley grass contains not only magnesium and calcium, but also several other nutrients such as vitamin K, boron, zinc and vitamin C.
Nettle is an excellent source of both magnesium and calcium, while providing several nutrients i.e. boron, vitamins K and D, silicon, zinc and vitamin C.
Insufficient digestive activity in the stomach is associated with poor absorption of magnesium and calcium. Ginger`s influence on stomach digestion may facilitate the bioavailability of both minerals. The milk stage of oat seeds provides one of the most soothing and gentle, tonics for supporting the nervous system. In addition to being a source of vitamin K, magnesium, calcium, boron and isoflavones (which are often used to support bone health), alfalfa also provides vitamin B6, which is needed for the proper utilisation of magnesium. As a food supplement for adults, take 2-4 vegicaps daily with food. Do not exceed stated dose unless directed by a healthcare practitioner. Not recommended during pregnancy or breastfeeding unless on the advice of a healthcare practitioner. Food supplements should not be used as a substitute for a varied diet. If taking prescribed medication consult a physician before using this product. 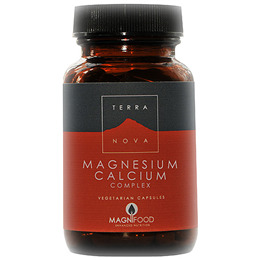 Below are reviews of TERRANOVA Magnesium Calcium 2:1 Complex - 100 Vegicaps by bodykind customers. If you have tried this product we'd love to hear what you think so please leave a review.